Missouri evening primrose is a sprawling herbaceous perennial with multiple stems that trail along the ground. Often seen festooning the tops of bluffs and rocky road cuts. Blooms May through August. Flowers are solitary, very large (up to 4 inches wide), 4-petaled, and bright lemon yellow. Often there are many blooming at once, making this a very showy plant. The flowers last only a day, usually opening in late afternoon and staying open until the next morning. Leaves are narrow and lance-shaped. Height: to 12 inches; spreads to cover 2 feet in diameter. Usually found on limestone glades, bluffs, and rocky prairies in the Ozarks, but this favorite hardy native wildflower is also a popular plant for gardening and in roadside beautification projects. 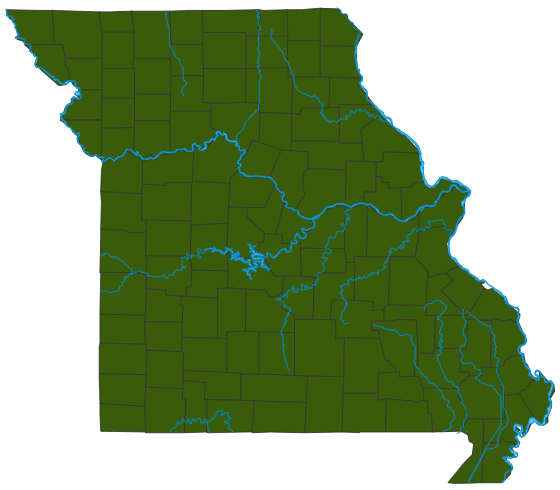 Statewide, but especially in the Ozarks south of the Missouri River. Cultivated statewide. Common. This species was formerly called Oenothera missouriensis, and some sources still use that name. Missouri evening primrose is a favorite garden plant, particularly in sunny rock gardens, borders, and meadows, where it requires little care. It doesn't do as well in wet and poorly drained soils. Flowers that open at night are usually pollinated by night-feeding bees and moths, and thus supply nourishment to those species. Some moth caterpillars feed on evening primroses as a main food plant as well.